SARITA — Sundays in South Texas are often spent with barbecue and family, so when Javier Vega Jr. and his family drove north near Raymondville, they anticipated one of those days. Vega, his wife, their three children and Vega’s parents spent the afternoon fishing in a remote area in Willacy County. What happened next was not anticipated. Two armed undocumented immigrants attempted to rob the family, and Vega did what he was trained to do, his mother, Marie Vega, said. He pulled out his own weapon in an attempt to defend his family, but in doing so, Javier Vega Jr. was shot in the chest and died on the way to the hospital. Vega’s father was also shot and wounded as he returned fire on the men. “Everyone in law enforcement knows that you never truly go off duty,” Sen. John Cornyn said. The year was 2014 when this fatal incident occurred, making Vega one of 128 Border Patrol agents killed in the agency’s 94 year history, Border Patrol Chief Carla Provost said on Wednesday as Cornyn and Sen. Ted Cruz stood behind her at a checkpoint Vega used to work. Also on Wednesday, after the president’s signature, two court trials and years of grief that continue to this day, the two senators and Provost, and many other law enforcement, helped unveil the renaming of the checkpoint in Sarita with Vega’s name. “When none of us are here, our kids and grandkids will drive past this checkpoint,” Cruz said. Most motorists driving north out of the Rio Grande Valley pass through one of two checkpoints — in Sarita, about an hour north from Harlingen on U.S. 77, or in Falfurrias on U.S. 281. On Wednesday in Sarita, Marie Vega spoke about her son, as she has done publicly on several occasions, including on national television in January, when she sat a few seats away from President Trump during a roundtable discussion in McAllen. The conversation around immigration has dominated much of the Trump administration, from the president’s executive order in the early days of his presidency barring citizens of several Muslim-majority countries from entering the United States, to last year’s family separation policy at the southern border. And Wednesday’s ceremony came at a time when the Border Patrol just hours earlier said its facilities that temporarily hold undocumented immigrants were overflowing. But immigration in America hasn’t changed much since that 2014 day, Cornyn and Cruz said. They shouldered the blame for Congress at large not being able to pass immigration reform. “Unfortunately, Washington, D.C. and the political class doesn’t really understand what the border is like,” Cornyn said. The immigration conversation has not been lost on the Vega family, who have not only participated in events detailing their son’s murder alongside the president, but the Vega family also appeared on the campaign trail with Cruz during his Senate re-election last year. They also endured two trials, which put both men who attempted to rob the Vega family behind bars for life — one was sentenced to 50 years in prison while the other was sentenced to death. But Marie Vega did not wade into political discourse on Wednesday. 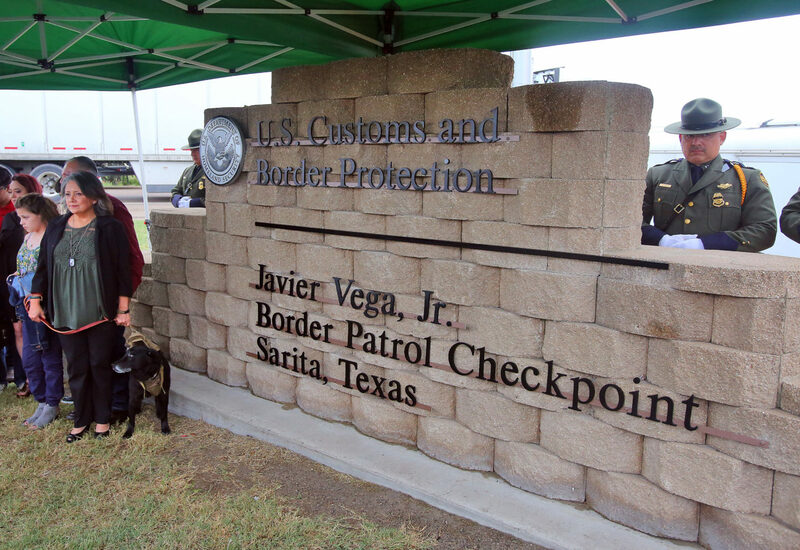 She instead specifically thanked many people on hand at the same checkpoint that Javier Vega Jr. worked as an agent inspecting vehicles with a K-9 named Goldie. Then, after the ceremony ended, agents pulled back a curtain to unveil the new brick signage for motorists driving through the checkpoint. Marie Vega walked over, held a leash to keep Goldie close and smiled for photos in front of her son’s name.